Hello boys and girls, it's photo time!!! I haven't posted any of my photos for awhile, so I thought I'd share some of my recent favorites. 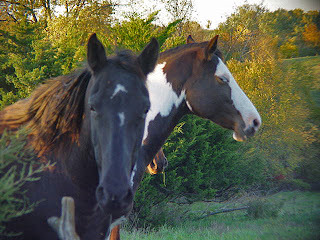 These are some horses that live not too far away from us. I seriously fell in love with the Paint, and my husband fell in love with the one with one blue eye and one brown eye. And these are just some miscellaneous pics, that either I or my husband like, so I thought I'd share them with you guys and get your opinions. There are more that I'd love to share, but I don't want to go overboard with posting too many photos ;-) I'll save some for another post. Absolutely beautiful! 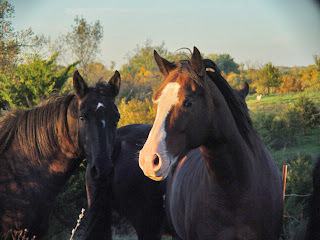 Those horses are gorgeous and I love all the other photos! What is that... a mushroom? Way cool. p.s. I have to get up early tomorrow to take Aurora to an appointment at the hospital so I don't know if I'll be online tonight. Hugs Bud! Great photos! Those are lovely horses. I'm assuming the other one is a mushroom. I'm sure you enjoyed taking photos on a lovely day. Thanks for sharing. I love that paint just from the pictures here. I can't imagine if I saw it in person. wow, you have such a talent!! Great work you do. Love, love, love the birds on the barb wire fence!! Lovely pictures I particularly like the two birds on the wire against the sky. Hi there, u just been given an award from ma blog www.limadang.com do pass it around thanks ya nice blog! keep it up! Beautiful horses, and great photos. Oh gosh. Beautiful pictures. I especially loved the horse pics.